Some people just can’t live without solid hardwood flooring, and who can blame them. These floors are amazing, they are a standard in many homes and businesses today. But did you know that a hardwood floor is so incredibly durable that it can literally out live you? Kind of morbid I know but this is one of the most amazing benefits that real hardwood has to off you. Despite lasting for years there are many other benefits to having solid hardwood flooring. Practicality - Hardwood floors are an incredible choice for any home because it will go with practically anything that you decide to pair it with. Foot traffic is not a problem because if your floors do ever begin to noticeable wear, you can always refinish it. Spills are far more easier to handle on a hardwood floor than those that happen on carpeting. Versatility - You will literally be thrown away when you see how many species, colors, textures, shades, and stains you will have to choose from. The selection is staggering for the beginner, but do not let this overwhelm your thoughts on it, with all of the choices available you will more than likely find exactly what you were looking for. Durability - This is solid hardwood flooring is one tough cookie! If you care for it the right way you can expect years of enjoyment and quality. Long Lifespan - Remember earlier where I said that you can always refinish hardwood flooring, well that applies to this directly. You see if you refinish your flooring when you need to it will last your lifetime. I have seen solid hardwood floors reaching over a hundred years old that still look so beautiful. The only difference is that they have more character. Allergies - Yes you heard right, having hardwood floors make cleaning an easy job. The moment you suspect dust gathering simple sweep and mop as needed. No fibers catching dirt here! Easy Maintenance and Cleaning - Say goodbye to that old vacuum and hello to easy maintenance. 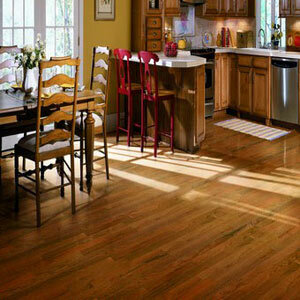 Spills can be easily cleaned and are actually very noticeable on a solid hardwood flooring surface. You will no longer have to feel around to find the spill. Natural Quality - You really can’t find a floor more sustainable as the material grow in your backyard.